Pineapples are this season’s favourite motif! We’ve seen them everywhere, embroidered on clothes, in gleaming gold painted ceramics and of course, in crochet! Merion’s scooped a delicious, fresh fruit salad of patterns for you to try! Sweet, juicy and gloriously exotic – we can’t get enough of them! 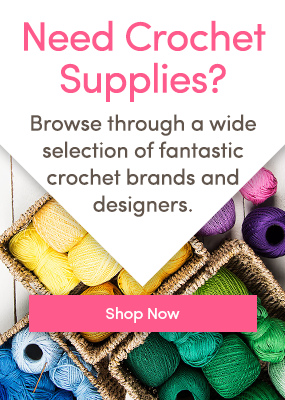 They look fantastic crocheted, for accessories and homeware, as well as appliqued to brighten up a pair of old dungarees or a jumper. I love Millie Masterton’s Pineapple Crush cushion (pictured above), in Paintbox Yarns Cotton DK. This super duper cushion will brighten up any summer sofa! Pineapple is the old English word for a pine cone – but in 1664, explorers discovered this delicious fruit in the Americas and named it “pineapple”, because it reminded them of the humble pine cone. The fruit itself has so many delicious uses – and the fibre is used for making furnishings and wallpaper. Kath Webber’s fabulous Pina Colada Shoulder Bag is perfect for the summer months – so get hooking now and you’ll have a fantastic bag for your holidays! String some of Flo and Dot’s Kitsch Pineapple Bunting for a tropical burst of sunshine in any room! You’ll need any 4ply cotton – the bunting pictured uses DMC Natura Cotton. Go even more tropical with Steel & Stitch’s fabulous Geo-Pineapple Rug. Crocheted in Hoooked Ribbon XL Solids, this will work up super fast and be adorning your floors in no time! Bill the Pineapple is your new best fruity friend! Add him to Megan Barclay’s fruit trio for a delicious fruit salad that will last forever. Bill is made up in Cascade 220, but your favourite aran weight yarn will work beautifully here. Pippa Pineapple is part of a pattern that contains three super fun amigurumi friends as part of the Summer Season from Lalylala. She is joined by Smila the ice cream and Keanu the surfboard! Crochet them all in your favourite 4ply cotton yarn – the pattern is chock full of tutorial help and information! We’d love to see your pineapple inspired crochet! Share your pictures with us in the Community! One Response to Pineapple Crush! Love this sooooooooooooo quirky ! !